Designing Women will host Holiday Tables November 6-8 at The Wichita Center for the Arts. Holiday Tables is the much anticipated, annual fundraiser for The Wichita Center for the Arts. 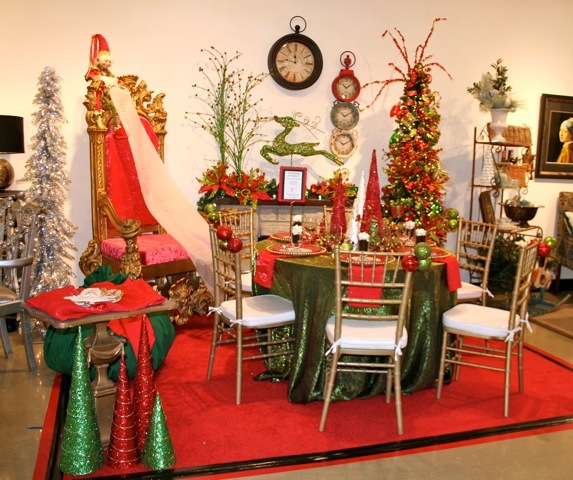 Each year, the galleries of the Wichita Center for the Arts are transformed into a decorating idea-fest with exquisite tablescapes for the upcoming season. Dining tables of all shapes and sizes are decorated by individuals, non-profit organizations, and businesses, showcasing home entertaining ideas. Guests can also shop in the Boutique for holiday items from the Traditions Home store and purchase home-made baked items. And don’t miss the delicious luncheon created by some of Wichita’s most creative culinary artists. When: Nov. 6, 7, and 8 from 10 a.m. to 4 p.m. Lunch served daily from 11:30 a.m. to 1:30 p.m. Additional fee for lunch. Cost: Holiday Tables admission is $10. Lunch is $12. Reservations may be made for groups of 10 or more. A Spanish Tapas inspired Preview Party will kick-off the event on Wednesday, November 5 from 7:00 p.m. -10:00 p.m. Preview Party guests will enjoy a buffet dinner, drinks and live music and a stroll through the decorated tables before they open to public viewing. When: Wednesday, Nov. 5 from 7 to 10 p.m. Cost: Preview Party tickets are $75 per person and reservations are required. Please contact Randy Brown at (316) 634-2787, extension 211 for ticket information. A chic, NEW event on Thursday night featuring Sangrias, light bites, live music, and an opportunity to see the decorated tables. Enjoy an informal fashion show that offers a sneak preview of “RODEO DRIVE a la WICHITA STYLE,” a collection of vintage designer clothing and handbags, generously donated by Liz Koch, Susan and Samantha Rudd, that is coming to the Center in early 2015 One of the exquisite handbags in the collection will be up for bid during the Girl’s Night Out event. ​ When: Thursday, November 6 from 5:30 to 7:30 p.m.
​ Cost: Girls’ Night Out tickets are $25 per person in advance or $30 at the door. ​Please contact Randy Brown at (316) 634-2787, extension 211 for reservations. About Designing Women – The Designing Women of The Wichita Center for the Arts is a volunteer organization whose mission is to promote and advance the welfare of The Wichita Center for the Arts (WCFTA) by providing financial support and services to the performing and visual arts programs offered by the WCFTA. About The Wichita Center for the Arts -Founded in 1920, The Wichita Center for the Arts (formerly the Wichita Art Association) (WCFTA) is Wichita’s oldest and most comprehensive visual and performing arts organization and the region’s only arts center that includes a school. It is primarily a privately funded organization, generating most of its revenues through gifts, endowment earnings, tuition, and ticket sales. The mission of the WCFTA is to improve understanding about the visual and performing arts among citizens in the region by providing programs which develop the creative process, expand aesthetic appreciation, and bring new meaning and understanding to the potential of being human.